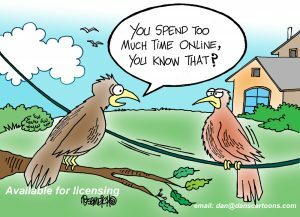 Bird cartoons for bird lovers and birding aficionados . 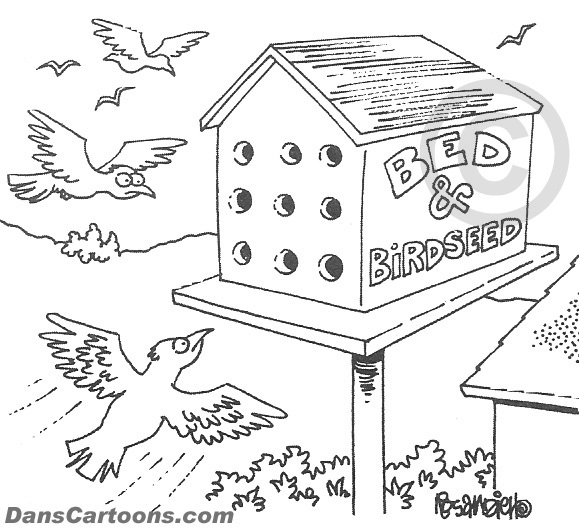 My bird cartoons have appeared in magazines for many years. You’ll be able to access a lot of these cartoons by clicking the sample I’m providing in this post. Parrots, robins and even partridge can be found doing funny and comical things. 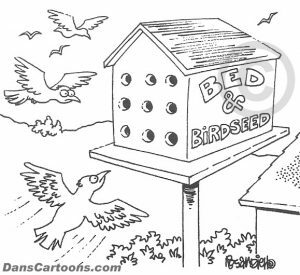 If you’re looking for woodpecker humor or birds enjoying a bird bath, you’ve come to the right cartoon catalog! I’ve always felt that birds represent a form of freedom. I try to include them in almost all of my cartoons I produce. Any cartoon that depicts an outside scenario will have birds in flight. I just feel compelled to include them because they seem to enhance the image and the overall look and feeling of my cartoons. These are not all of the cartoons about birds that have available in my inventory. I can show more if you request them. Don’t forget that I also offer custom cartoons and illustrations for any books needing specific kinds of avian humor! Send me an idea or concept and I’ll take it from there, by creating a rough sketch or concept for you to review. If you like what you see then I’ll go over in ink and scan into Photoshop and format the artwork. I’ve done cartoons bird cartoon characters for Bird Talk magazine. I can create the same for you. Contact me with your questions and if you need a quote to have an image created, no problem. If there are any black and white line drawings that interest you in my collection, and that artwork would look better in color, tell me. I will colorize anything upon request and send it for your review. I also change captions underneath any of the cartoons you want. These changes can be made so they cater to your content. Keep this in mind and thank you for visiting!